BlackBerry Atlas Video Walk Through And Spec Sheet! Salomondrin has got a new video of the BlackBerry Atlas in action for us all to have a look at coming after it's first on screen appearance. This device is running platform 6.0 and all signs seem to point to the fact it may not even show up on the US market if it indeed shows up on any market at all. 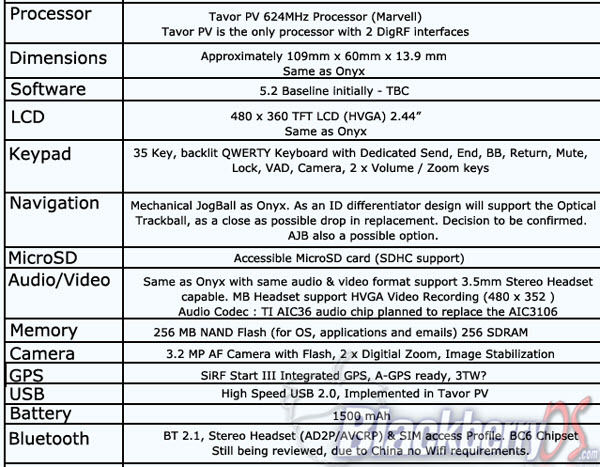 The folks over at BlackBerryOS also got their hands on a spec sheet (after the jump) for the device which when reading it, makes it sound like RIM is even unsure of what to do with the Atlas, or that it's geared for markets in Asia as noted in the Bluetooth section where it notes China's no WiFi requirement. Have a look at the documentation and video, be sure to post your thoughts on it in the comments or in the CrackBerry Forums.